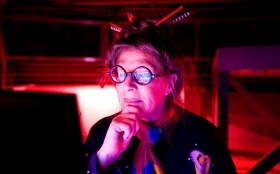 Shelley R. Bonus, an astronomical historian and lecturer, is also an award winning performer, writer, and photographer who has worked with both Lily Tomlin and Melvin Van Peebles. A real 21st Century renaissance woman, Shelley, (who among other things is a mother who holds the distinct honor of being the first woman ever to be hired to clown for Circus Vargas), Bonus teaches astronomy for the ULCA Extension Program, and she has given planetarium programs at Santa Monica College at the John Drescher Planetarium. Shelley is an experienced telescope operator at the historic Mt. Wilson Observatory 60-inch telescope. A superb bilingual (English/Spanish) educator and communicator, and an inspired star gazer, Shelley, who believes that we are all the brothers and sisters of stars, has become renown amongst her audiences for her enthusiasm, her sense of humor, and her unique ability to master her subject, therefore making the mysteries of the night sky come alive for not only professional, but amateur astronomers of all ages as well. Shelley has experience with all age levels, from pre-school to senior citizens. Since her shows are presented live, she can tailor show content to fit any teacher's particular needs and specifications. Shelley can schedule shows at your convenience, any hour of the day, any day of the week, and she can even provide evening telescope "star parties" or daytime sunspot viewing sessions. 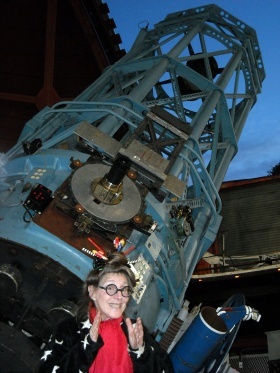 Shelley Bonus is available for lectures, star parties, and "Shelley's Out of This World Astronomical Fun and Facts" for your for your customer's interest and enjoyment. They won't grow old when they're on hold instead they'll be thinking of what to buy next. Those seeking Ms. Bonus's services can call or send e-mail. This page has been accessed 29,104 times.